In high-contrast black and white, the opening scene of this film fades up on a large and airy room. A small man stands in the middle distance, dramatically spot-lit and faces a large sculpture that dwarfs him. A second man enters from a doorway at the end of the gallery, back-lit in silhouette, and whose confident voiceover booms out on the soundtrack as the two men turn to face each other on camera. Voiceover: In the Philadelphia Museum of Art is a collection of paintings and objects by a man whose unique view of life has greatly influenced modern art. Man: So here you are, Marcel, looking at your big glass. Marcel: Yes. The more I look at it, the more I like it. 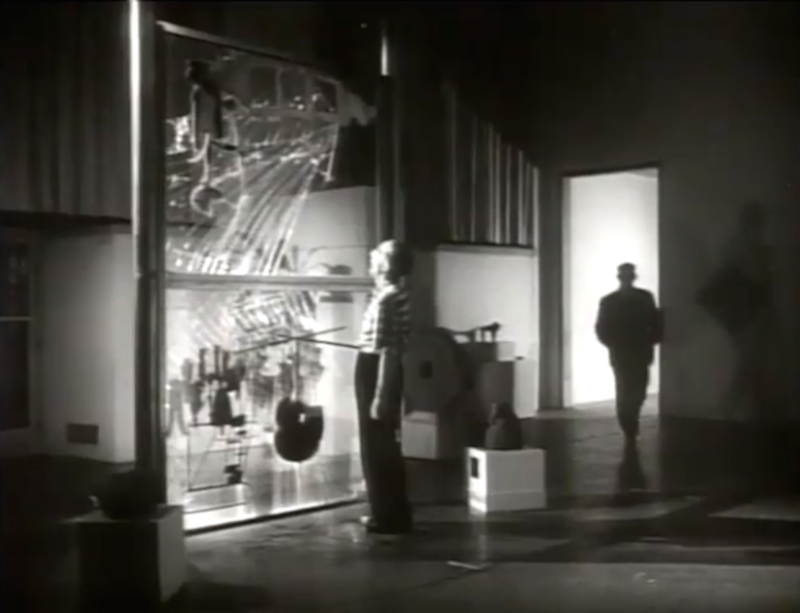 This highly staged opening scene is from the January 15, 1956 episode of NBC’s series Conversations with Elderly Wise Men, where the director of the Guggenheim, James Johnson Sweeney, interviews artist Marcel Duchamp. Beginning with Duchamp’s The Large Glass (1915–23), the pair walks around the Philadelphia Museum of Art’s galleries, stopping in front of recent acquisition of the artist’s sculptures and paintings. They talk amiably about the parallel chronologies of Duchamp’s life and work, as well as his influences—Cubism, Impressionism, and his love of playing chess. The dramatic Hitchcock-esque lighting and the pair’s stilted conversation (not to mention the program title I initially read as “Conversations with Elderly White Men” and which wouldn’t be a mischaracterization of the series as a whole) dates this interview as something of a conversational fossil in comparison with the online informality to which we have become accustomed in HuffPost Live interviews and Reddit AMAs. But even so, the Duchamp/Sweeney interview reveals as much about the function of the public presentation and broadcast of the “artist in conversation,” as it does Duchamp’s own recollections of his work. And yet the coaxing out of thoughts, and the broadcast of such reflection to a public, remains a central part of how museums bridge the interaction between artists and the audiences. The question of what it might mean to be a spokesperson for one’s own art is still an urgent one. And although this Duchamp/Sweeney interview is a rarity within the Walker’s Ruben/Bentson Moving Image Collection (a collection that is almost exclusively dedicated to the collection and preservation of artists’ moving image art works, not descriptions of them as this interview appears to be), the artist-in-conversation format nonetheless remains a central part of the Walker’s public programs, and is a cornerstone of the Walker Dialogues program that broadcasts its conversations within the Walker Channel. In contrast to Brakhage and Kippenberger’s incorporation of the in-conversation as an extension of artistic narrative, Duchamp was traditionally professional; on the one hand there was the work, and on the other there was him talking about the work. In short, they were separate entities with distinct functions. That Duchamp gave so many public interviews was testament to his own capacity to speak about his work with great ease and accessibility to general audiences. His love of the formal qualities of the work and the pleasure of making something could be easily understood. Although first broadcast by NBC in 1956, this Duchamp interview was recorded in 1955. The timing is significant: the recording took place in the same year in which the artist was officially recognized as a US citizen. Duchamp’s increasingly widespread recognition as a highly influential artist merged that year with the public identification of Duchamp as an American. And although it’s hard to tell from the polished sheen of this formal interview, there was also a particular intimacy between interviewer and interviewee; Sweeney (along with then-MoMA advisory director Alfred H Barr and art collector James Thrall Soby) attended as a witness to Duchamp’s naturalization ceremony. This film thus stands as a document of transition of an individual within a widening audience: it locates a moment of shifting national identity of an artist, and the acquisition of his work into a major American public collection. These things can be read implicitly as the “in conversation” has shifted from broadcast item to historical artifact. Public in-conversations that occur with an audience present, as well as those simply recorded for an at-home audience, are deep resource documents for public and professional scholars and, like Duchamp on NBC, such materials can be read implicitly as well as explicitly, critically as well as illustrative. These conversations are, after all, crucial moments of public interface, which provide oral histories to the artworks we encounter, and sometimes even challenge the hierarchies between supporting interview and artwork. I’m reminded here of pianist Jason Moran’s 2005 sampling of an Adrian Piper interview, where Piper discusses the artists communication with their audience, as she explains, “If artists intentions and ideas were more accessible to the general public, I think it might break down the misunderstandings between the art world and artists and the general public.” It was not without a certain shrewd self-reflexivity that former Walker curator Bartholomew Ryan inserted Moran’s recording as an introductory soundtrack to his in-conversation talk between artists Liam Gillick and Hito Steyerl, the opening of which is captured in the clip below. In its most basic form, the format of the artist in conversation traditionally looks a bit like that of a talk show. It comprises an interviewer (a professional interlocutor, or expert of some kind) and a subject (the artist). The third element—the public—doesn’t need to be present at the time of the conversation necessarily, but present or not, it is still the primary reason the conversation takes place at all. It is this public that provides the unspoken pressure for the conversation to “go somewhere”—to be engaging, surprising, argumentative or revealing. The interviewer and the interviewee must become co-producers of their own social scenario. Both must piece together narratives, stitch together anecdotal evidence, partial memories, and occasionally confessional material that, when combined, allow the audience to slip between the feeling of eavesdropping on a one-on-one conversation while watching two people engage in something akin to a performance. It is this rather vertigiousness movement between intimacy and information, between dialogue and monologue, that gives the in-conversation its allure, not to mention the entertainment produced by accident and spontaneity. But as the formal manners of Duchamp’s NBC interview have waned, the personalization of time and broadcasting has changed, and audiences have become increasingly sophisticated and responsive listeners. Artists, meanwhile, have increasingly taken control of their own mediation through the non-scarcity resources of online self-publishing. Questions, too, have been raised over the authenticity or productiveness of fatigue-based public conversations, like the Serpentine’s annual Marathon series (where artists, writers, scientists, film-makers, choreographers, theorists and musicians come together for a hectic schedule of non-stop talks and events). The desire to cut out the middle-man interviewer has had great success in Reddit AMAs, though notably outside of the sphere of visual art discussion. But the logical extension of cutting out the middle-man is to undo the format completely—to begin a conversation not with the interviewer or even the artist, but the artwork. In many ways, that’s the dialogue that the artist seeks to establish with their work in the first place.